Although the information and recommendations at this internet site are presented in good faith and believed to be correct, First Aid to Save a Life Pakistan makes no representations or warranties as to the completeness or accuracy of the information. Information is supplied upon the condition that the persons receiving same will make their own determination as to its suitability for their purposes prior to use. In no event will First Aid to Save a Life Pakistan be responsible for damages of any nature whatsoever resulting from the use of or reliance upon information from this site or the products to which the information refers. 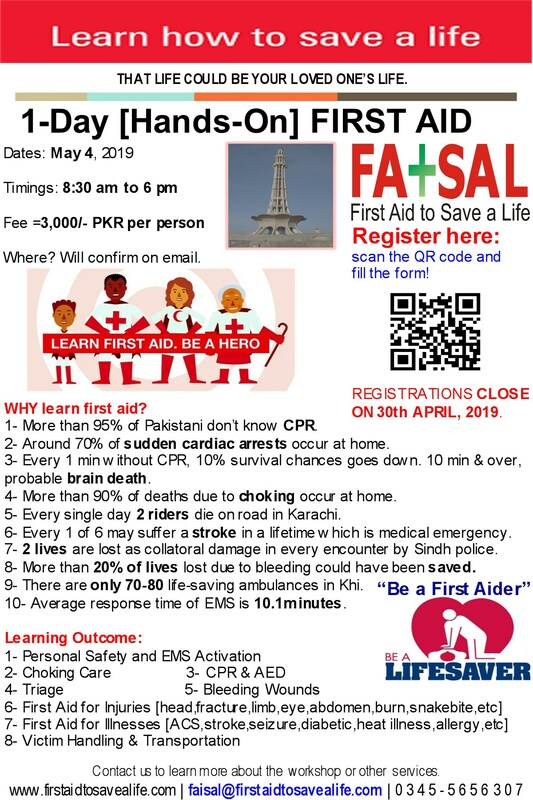 First Aid to Save a Life Pakistan does not warrant the accuracy or timeliness of the materials on this site and has no liability for any errors or omissions in the materials. Copyright Information: All MEDIC FIRST AID International trademarks, service marks, designs, music clips, videos, documentation and other content included on the Site and offered through the Services is the property of HSI and MEDIC FIRST AID International and its content providers and is protected under international, federal and state trademark, copyright, patent and other intellectual property laws. First Aid to Save a Life Pakistan is approved training center is thus allowed to use their materials but bound to adhere the rules made applicable to Training Center and published in Training Center Administration Manual, version 2010.